In ‘Best evidence encyclopedia’ wordt een overzicht gegeven van 61 programma’s die gebruikt worden in de basisschool (graad K-5) en die onderwerp zijn geweest van hoogstaand evidence based onderzoek. Samenvattend kunnen volgende bevindingen worden gegeven. Particularly positive outcomes were found for tutoring programs. One-to-one and one-to-small group models had equal impacts, as did teachers and paraprofessionals as tutors. Technology programs showed modest positive impacts. Professional development approaches focused on helping teachers gain in understanding of math content and pedagogy had no impact on student achievement, but more promising outcomes were seen in studies focused on instructional processes, such as cooperative learning. Whole-school reform, social-emotional approaches, math curricula, and benchmark assessment programs found few positive effects, although there were one or more effective individual approaches in most categories. 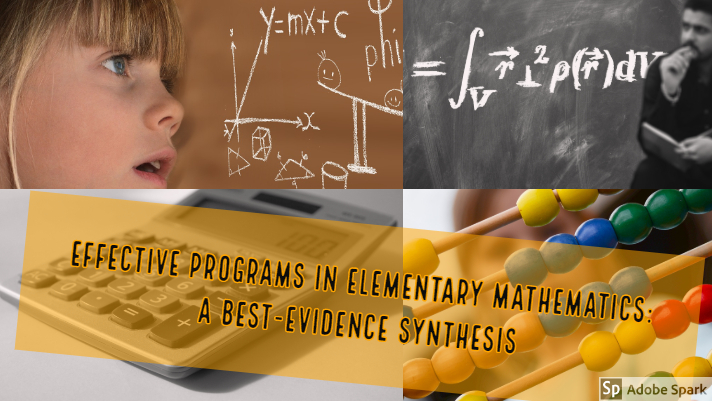 The findings suggest that programs emphasizing personalization, engagement, and motivation are most impactful in elementary mathematics instruction, while strategies focused on textbooks, professional development for math knowledge or pedagogy, and other strategies that do not substantially impact students’ daily experiences have little impact.